How can we justify stating that the citadel area was exclusively for a higher class or category of people? This is an old and controversial discussion. When Marcia Fentress tried to evaluate the distribution of prestige items and objects made of precious materials by contrasting the Citadel Mound of Mohenjo-Daro with what found in the Lower Town, she found no major differences. However, the Citadels, both at Harappa and Mohenjo-Daro, are probably the oldest cores of the urban settlements, and might have been considered prestigious neighborhoods just for that reason. Moreover, even though we know very little of Harappa, it is clear that the buildings on the Mohenjo-Daro Citadel are quite special and somehow imposing. But, in short, this does not necessarily imply that the occupants were upper class; nor that they maintained their possible upper social rank unchanged through time. For example, in the latest phases of occupation the Citadel of Mohenjo-Daro became an industrial block, with abundant craft refuse chocking the interior of the "Great Bath" and its drains. There is no justification for this statement and it is not supported archaeologically. 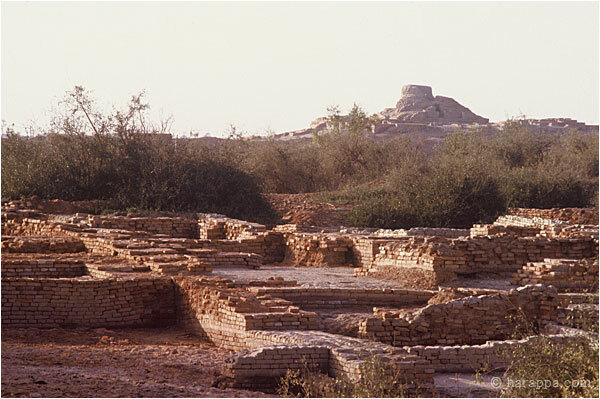 Above: Mohenjo-daro Lower Town: HR area and Stupa.